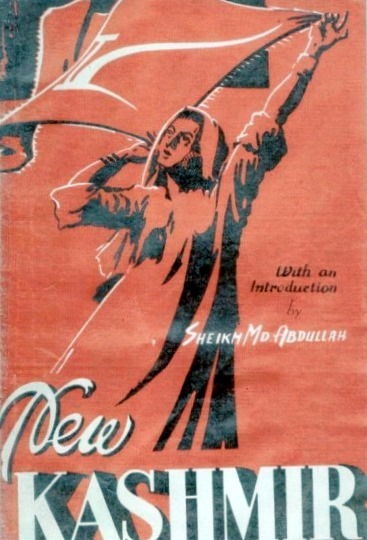 "The pamphlet cover displayed above is from a title published in 1948 by the Kashmir Bureau of Information in Delhi. The design is arresting, and clearly leftist in inspiration. 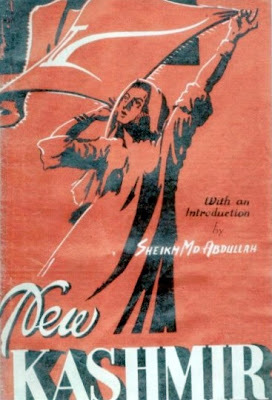 The designer (the name is in the bottom left hand corner) was Sobha Singh, at the time a young progressive artist. In later years, he became better known for his religious paintings of the Sikh Gurus. 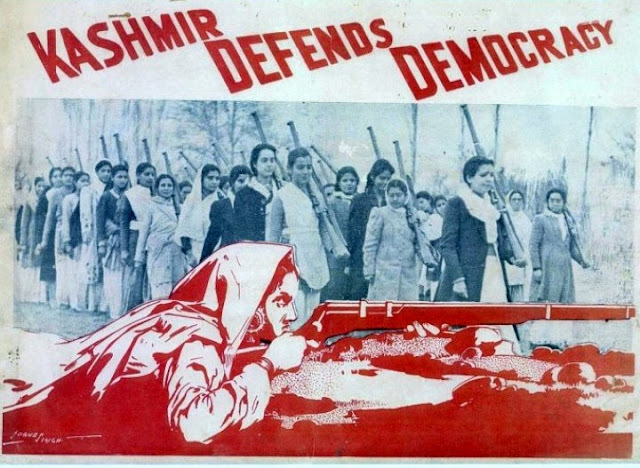 The woman in the foreground depicted lying on the ground and aiming a rifle is Zuni Gujjari, a woman from a milkman's family who became renowned as a militant supporter of the National Conference, the main Kashmiri nationalist party. The black and white photograph is of members of the Women's Self Defence Corps, a women's militia set uplargely by Communist supporters of the National Conference in October-November 1947, when Srinagar was in danger of being overrun by an army of Pakistani tribesmen." 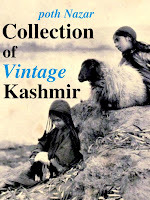 Found it at the site of Andrew Whitehead author of A Mission in Kashmir. 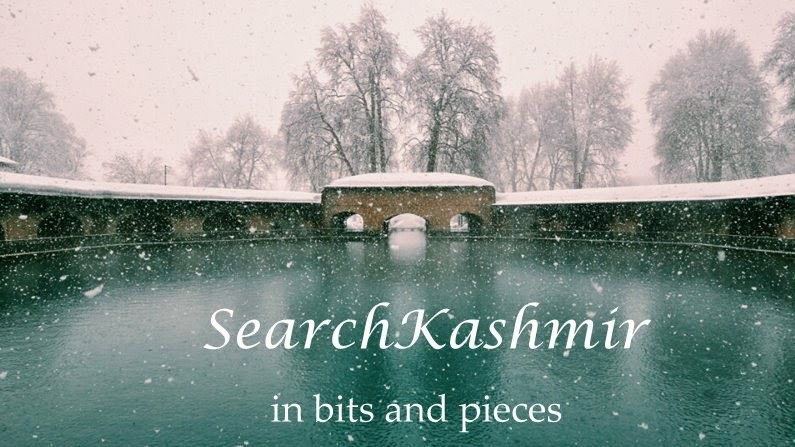 Besides Zuni Gujjari, the other women featured in this incredible image include Krishna Misri (nee Zardoo), her younger sister, Indu, Begum Zainab, Jai Kishori Bhan. Usha Kashyap - known now as Usha Khanna- wife of Indian freedom fighter Rajbans Khanna (associate of Director Bimal Roy) , niece of Balraj Sahni (one of the pioneers of left leaning IPTA or Indian People's Theatre Association and the hero of 1972 bilingual film Shayar-e-Kashmir Mahjoor based on life of Kashmiri poet Mahjoor) and the founder of Samovar restaurant at the Jehangir art gallery in Mumbai. Tip off- Autar Mota ji. Thanks! "My mother Shanta Kashkari is also in photograph. She was an active member of the peace brigade formed for voluntary works, when Kashmir was raided by the raiders.My mother is 2nd behind Jai Kishori Ji [woman under first 'E' of DEFENDS]. She is wearing white saree, head and arm is covered by the saree." Shanta Kashkari would be the woman under left edge of 'D' of DEFENDS. I am told Begum Zainab was sister of a famous politician known popularly with odd name "Gull'e Raid'e" (GM Sadiq?). I believe in 1972 Begum Zainab herself went on to be MLA from Amira Kadal. 1975 was the elected M.L.A. from the Amirakadal constituency. constituency three times in 1957.1962 and in 1967.